BE what you already are. You CAN use and direct your Light to create and experience what "seems as if"
Wouldn’t it be awesome and amazing if this turned out to be the year that life fell into place and began working in the way you've always hoped, wished and prayed it would? Well, it CAN. The fact of the matter is that it WILL as soon as you enable and allow it to. This enabling and allowing doesn't necessarily mean that you must DO more, have more time, get more skills or even change what you have been doing. What is necessary is to BE the Light. The brightest light that you can possibly BE. It seems, especially in this day and age that MANY are looking for answers to make life work better. Since that applies to MANY...MOST in fact, perhaps you are too. It also seems that due to what so many "believe and perceive" as being necessary to reach this "make life work better" place, MANY claim they WANT and NEED this, WANT and NEED that and WANT and NEED this other thing, fully believing that if they GET this "thing" that they truly think they WANT and NEED that life WILL work and BE better as they are WANTING it to and "hoping" it will. Perhaps you find yourself there too. Yet as those who have "been there and done that" will tell you, the receiving of some "thing" WHATEVER it might be, at some point always leads to and has MOST walking down the very same path. WANTING and NEEDING something more...something better...something that they're certain, on a surface level WILL make a "lasting difference" this time around (although no THING has in the past) while at a "deeper level" consistently hoping, wishing and praying that they'll GET IT so life can become "better" once and for all. More WANT, more NEED, more "TRYING to make life better", more hoping, wishing and praying, more of the same old scenery, more of engaging in the same constant, grueling and life draining struggle to DO that and the slow, hard, disappointing, not to mention NON-FULFILLING pace that follows becomes a way of life. No wonder so many DO so much, always find themselves wanting and needing more time, yet REGARDLESS of how much TIME they put into WHAT they DO, aside from how much "stuff" they get, they remain disappointed and unfulfilled. It seems we're always attempting to escape from what is in the present in order that our past, less than desirable stories not be repeated. A focus on our past and current stories (experiences) are projected into the future and the same story keeps "showing up." Rather than transforming our life stories into ones that lead to The Light (where we "truly desire to BE) we "unconsciously continue down the path that leads to more shadows and darkness and has us always scrambling and WANTING to finally REACH the Light that we SEE at the end of the tunnel. WANTING to reach this "place", wanting to make life better and the lack, limitation and HARD WORK that this way of DOING things provides, CAN and often does keep us seemingly trapped within the tunnel and in many cases leads to mental, emotional and physical overwhelm and in some cases, dark despair. As a result of DOING things in the way that MOST do, it "seems as if" although many can SEE it, it "seems impossible or difficult at best to finally reach this "Light at the end of the tunnel" that everybody SEES but never reach and remain there long term. It's not long before some new event, condition or circumstance "shows up" and we find ourselves right back in the same tunnel, WANTING and NEEDING something else so we might make our way toward this "light" that we see with the hope and intention that this time we'll finally become enabled to remain there. DOING things in that way makes life "seem as if" that's how life was designed and meant to be. It's just "how things are" MOST will tell you. Granted, it CAN and in many cases DOES "seem that way." On the other it doesn't HAVE to BE that way. YOU can change that whenever YOU choose. Although that's "true", it's going to be necessary to "change your story" FIRST. Hoping, wishing, praying, TRYING to "make life better", waiting to reach the Light at the end of the tunnel and WANTING what you "think" is outside of your reach currently, (somewhere down the distant path) only serves to keep life from becoming better long term and BEING all that we truly desire for it to be. What's more, in MANY cases, this "chosen way of BEING only tends to push away WHAT so many "claim" they DO want and keeps just as many "seemingly trapped" within a "seemingly inescapable cycle" of WANTING more, DOING more and DOING it with greater intensity yet seldom if ever receiving what they do "claim to WANT." They never make it through the "tunnel", seldom SEE let alone ENJOY the Light of day yet are always WANTING to. Is it any wonder WHY we seem to be consistently "seeking out" and trying to find something to fill this gnawing void of WANT, always thinking that we NEED something to do so, consistently repeating the same old story and seldom if ever successfully bridging the gap between where we are and where we "truly desire to BE? Getting there doesn't require WANTING or NEEDING anything other than what you already have. That's all you really NEED is to "figure out" how to USE what you DO already have in a way that eliminates WANT, NEED and the struggle that so many "needlessly experience" as they go through life. I can assure you that what most WANT and think they NEED and what they "truly desire" are mutually exclusive. They're totally different things. We'll get into more depth about WHERE we "truly desire to BE" is and what underlies every want in a few moments. First though, let's look at WHY so many remain "seemingly stuck" in this less than desired cycle that has us repeating and experiencing the same old sad, disheartening and displeasing story all the while trying to reach the light at the end of the tunnel. Where do I WANT and/or NEED to go to "make life better?" What do I WANT and/or NEED to see to "make life better?" What do I NEED to DO to GET more of what I WANT in life to "make life better?" The result? Life doesn't become "better" in a lasting kind of way as so many "hope, wish, pray and think" it will. The reason it doesn't is simply because we have forgotten and lost sight of WHO and WHAT we truly are. We've forgotten and "unconsciously utilize" the power that's been freely provided to us to "consciously create" what we "truly desire" to BE, DO and/or HAVE in life. I'll assure you, we (which includes YOU) are FAR MORE powerful than MOST "think" we are. Because that's "true", we tend to overlook the fact that what we focus on expands and what we FEED grows and it NEVER EVER fails. A focus on a WANT and/or a NEED to "make life better" only serves to create the same old story. Put another way, we place focus on the WANT and NEED to make life better which inevitably EXPANDS and GROWS into MORE WANT and a consistent NEED to "make life better." We "unconsciously create" and sustain the VERY cycle that we claim we DON'T want and find ourselves always TRYING to change things and escape from the very cycle (story) that WE ourselves are feeding and creating. There's a word that describes the lunacy behind this approach. It's called "insanity." To RECEIVE something different than we have; to GET what we "truly desire" requires DOING something different which is something that MOST have ZERO awareness of or simply refuse to do. Ready to escape the lunacy and cease to engage in this form of insanity? A change of focus is where it begins. Let's call it a shift from an "unconscious focus" to a "consciously directed focus" for now. To CHANGE our past and current stories requires changing our way of looking at, SEEING and FOCUSING on things...ANYTHING and EVERYTHING that we have a sincere desire to change. What do you truly desire (Love) to BE, Do and/or HAVE more of in life? The difference in these 2 ways of BEING and ways of asking get to the "heart of the matter" and reveal what we "truly Love and truly desire" in life. As we move forward in life, although VERY subtle and "seemingly insignificant", this re-framing initiates a reformation of beliefs, a VERY DIFFERENT focus, ignites completely different emotions, enables us to DO things in a more efficient and "pleasing" manner and provides very different results. Seemingly miraculous results that we Love. If you're currently unable to SEE HOW or WHY that ALWAYS holds "true", perhaps that will become crystal clear in a bit as we progress further and get to the "Heart of the matter." This "Getting to the heart of the matter" reveals how and why what we feed and focus on DOES expand and DOES create "matter", aka the "stuff" that we claim to WANT and honestly believe we NEED which we think will make life better once and for all. What follows in BE the Light will explain in "uncommon detail" WHY this re-framing and REFOCUSING is VITALLY important IF you're sincere and serious about, and you'd "truly Love" to fulfill WHATEVER heartfelt desires you might have in the simplest, quickest, easiest and least effortless way possible. I can tell you based on personal experience that it's FAR MORE simple, quick, easy and effortless than MOST believe it CAN be FOR SURE. You could call it the "short path" that leads to where we ALL truly desire to BE which is ALSO a necessary 1st step for finally getting the kind and quality of stuff that we DO want. Are you ready to cut through all the cookie cutter approach personal development programs, the endless sea of self help books, the countless seminars, the endless array of techniques, processes and the all too common hyped up claims of calling forth your own personal "Genie in a bottle" in your attempts to get what you WANT to "make life better?" Are you REALLY and truly ready to bypass the slow hard pace that MOST choose due to the conventional wisdom that instructs us that it's "necessary" to DO MORE and to "make things happen" which only serves to keep so many "needlessly and seemingly trapped" within a "seemingly inescapable cycle" of consistently TRYING to force and/or make things happen rather than DOING what's MOST effective which is "allowing things to unfold?" Are you WAY PAST ready to move through and beyond consistently finding yourself angry, agitated, frustrated and perhaps even feeling hopeless as a result of consistently experiencing a consistent flow of limited and "less than desired results" that this form of guidance provides? There is an easy way to rise above and transcend what so many have been taught, bought into, believe to be and refer to as human limitation and the constant, grueling and futile struggle that follows in our VERY limited, short sighted attempts to "make life better." Learn to look at, SEE yourself as and BE the Light that you are. More specifically BE the brightest light you CAN be and allow that to BE. Do your VERY best, allow that, observe and adjust as necessary all the while keeping focus on the Loved result. That's how "simple" it is. Really and truly, rather than "learning how" to DO that and WHY it IS so important, it's really more a matter of "unlearning and deprogramming" what we've for the most part been led to believe is necessary. Chances are better than good that you're "unaware" of and perhaps oblivious to how BEING the Light applies in "physical life." The question I'd ask and STRONGLY encourage you to ASK yourself, REALLY think about and get to the core of is WHY? The answer as I see it is VERY simple. You haven't been exposed to, been taught nor learned HOW and WHY BE the Light applies in ALL facets of life or how VITALLY important it is for receiving what we "truly desire." Emphasis has been placed on and you've no doubt LEARNED about what you've been TOLD is most important, how to DO things, how to GET more things and bought into the BIG LIE regarding how to "make life better", yet little to NO emphasis has been placed on what's "truly important", what EVERYTHING IS...what it "truly IS", nor where it ALL comes from. Where it ALL "truly" comes from...bar none. Because of that, you may lack the vision of what and how to BE in such a way that moves you into the Light of "accepting and allowing life to BE as it is", expressing "Heartfelt Gratitude" for that...unconditionally so you can begin receiving more of what you "Love, truly desire and are "truly looking for." What we HAVE for the most part been taught is that we "NEED to DO and GET more to make life better" and the only way to "get there" is through our DOING more and DOING it for longer periods with greater intensity so we might start "getting and receiving" what we think we WANT and NEED to make life better. We don't GET what we WANT, we GET what we're choosing to get which in 99% of the cases is FAR LESS than we'd "truly Love and truly desire" to have. We place vision and focus in the wrong area and on the wrong stuff and we become lost in the mire. We simply don't know how to get there from here so we tend to hold the "wrong vision" which blurs and fogs our focus and we end up "looking for Love in all the wrong places." Although an accurate description in the world of shape and form, in the BIGGER scheme, that's a misnomer too really as you'll hopefully discover soon. Everyone "claims" they WANT some form of transformation in their lives. Yet MOST are "unwilling to slow down long enough to DO what's "truly necessary" to experience this transformation. Pssssstttt...come closer and read carefully. Here's another "secret." A not so "secret" one. The first step toward transformation begins with awareness. If you're not experiencing the kind and quality of life that you'd Love and "truly desire" regardless of WHAT you do or HOW MUCH you do of WHATEVER it is that you do, it's going to require a willingness on your part to enhance and expand YOUR awareness beyond the limitations that your past and current level of awareness has, is and will continue providing. It's THAT level of awareness and your choice to expand and/or limit yours which determines what YOU are inevitably allowing into your life. If what you're currently "allowing" is less than you truly desire to see, I believe I can assist you with that. In fact I KNOW I can IF you'll enable and allow me to. It's my "Soul Purpose" to enhance and expand "awareness" on a global scale. It's what I DO. More importantly, it's what I LOVE to DO. Because that's "true", it's my hope, purpose and intention to not only educate but empower you as well as DO the very best I'm able to provide you with ALL the insight, tools and knowledge you could possibly need to BE the Light that you are in a way that enables and empowers you to FULLY UTILIZE your gifts, talents and share with the world the IMMENSE VALUE that you ARE and at the same time eliminate the NEED to WANT anything and relinquish the self sabotaging habit of "trying to make life better." I DO that, so you might begin to "consciously engage" yourself in such a way that assists in creating a life (and on a larger scale a world) we ALL desire, have always dreamed was possible, yet due to FAR TOO MANY factors to cover here; including but not limited to "making life better" and GETTING what we "claim to WANT", "seem to be" unable to make a "tangible reality." It's VERY DOABLE and so much easier and more simple than MOST understand, hence WHY and expanded AWARENESS is necessary. It's my hope, purpose and intention to point you toward the path that leads to what you "truly desire"...what we ALL truly desire in a way that the enables and allows the WANTS we ALL have to "flow to" rather than "away from" you. Sometimes in "seemingly miraculous" ways. Let's take it a step at a time though. What I'm going to reveal next eliminates ANY and EVERY possible form of limitation in ANY and EVERY aspect of life should you choose to internalize and "apply" it. I'll warn you up front though it's MOST DEFINITELY not "common knowledge" and because that's "true", few "choose" to accept it let alone DO it or USE it "consciously", I'll assure you. Because it's not "common knowledge", combined with the fact that MUCH of the knowledge you (and MOST) HAVE learned, adopted and "believe to be true" may very well attempt to debunk and/or conflict with what follows, what I'll be sharing and what you do with it is going to require an "uncommon choice" on your part. Make a choice and a commitment to Open Yourself to learning, growing, stretching, expanding and going beyond what is familiar. Here's a VITALLY important consideration to determine if that's BEST for you and the results that YOU and so many "claim to WANT" yet unknowingly sabotage by simply DOING the same thing over and over again which can only produce the VERY SAME less than fulfilling "common results." "Uncommon choices" are what create "uncommon results." To create these "uncommon results" it's going to require an uncommon form of knowledge followed by a form of DOING what most simply "choose" not to do. If on the other hand "common results" are your cup of tea, continue DOING what you have been and/or listen to and DO what those who receive, believe and adhere to common knowledge and who consistently produce these "common results" do. Like ANYTHING and EVERYTHING in life, it's ENTIRELY up to you whether you'll "CHOOSE to apply" what I'll be sharing or not. One thing I can assure you of based on personally "trying it both ways", is the fact that "applying" what follows will point you toward and lead you down a life path filled with awe, wonder, heartfelt gratitude, ever greater possibilities and in FACT, open doors of INFINITE potential that we ALL have access to. 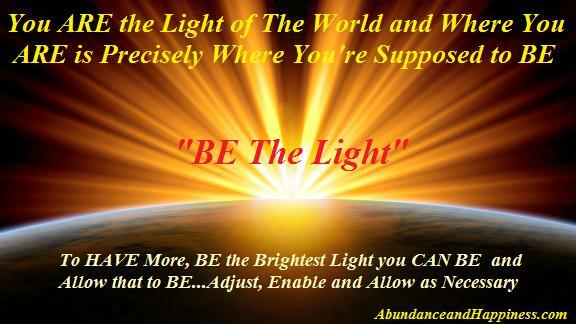 BE the Light that you are...the brightest Light you CAN BE and simply "allow that" to be...REGARDLESS. That may sound overly simplistic and perhaps even crazy, but based on my own experiences; a VERY broad and diverse range of experiences I might add, it's proven true time and time again. That's really and truly all that's necessary to transform your entire world, and in some cases, quite literally in the blink of an eye. Regardless of what so many think, believe and how they "choose to DO things", experiencing a life of awe, wonder and opening the doors of possibility and INFINITE potential is ONE VERY simple, VERY profound and life transforming choice away. Not to sound redundant but because it IS so VITALLY IMPORTANT, that ONE single choice is to simply BE the Light that you are...the BRIGHTEST Light you CAN BE and allow that to BE. More specifically, in more down to earth "human speak", BE the brightest, most loving, compassionate, empathetic, understanding, genuine, ACCEPTING and CONTRIBUTORY person you CAN be...unconditionally. In other words DO the very best you CAN to BE each of those things, DO your very best to make choices and take action in a way that integrates, aligns and harmonizes with those ways of BEING in ALL that you DO. Do THAT in a way that also aligns and harmonizes with YOUR core values, with what you LOVE and truly desire to SEE. DO the best you can to contribute and provide VALUE to the world in a way that you Love; in a way that serves the GREATEST number of others and simply "Let go" of the rest. Let go of the "perceived need" to figure things out. Let go of the anxious expectation, anticipation and frustration that stems from worrying about HOW, WHEN and/or IF things will change. The "change" will take care of itself. LOVE always changes things. Integrate and DO that in ALL you think, say and DO; meaning think, speak and act in "loving ways" unconditionally and things WILL change. The more you "choose" to DO that, the greater the change and the closer you'll GET to where we ALL truly desire to be. The desires of your heart will become real and tangible. DOING that enables and allows life...YOUR life to BE all that it CAN BE. And I'll assure you, what that is, is FAR MORE than MOST (perhaps even YOU) can possibly conceive or imagine right now. You could say that life WILL become INFINITELY AWESOME and the many life paths you have to choose from will become ILLUMINATED, enabling you to DO what's "truly necessary" to "consciously engage" yourself as you DO, create and SEE more of what you love. Each choice you make and EVERY step you take will become clearer, more concise, on target and move you ever closer toward where we ALL truly desire to be. Happy, Whole, Complete and Fulfilled. That's what "truly underlies" all of our WANTS, all of our DOING and all of our endless and futile attempts to once and for all, "make life better" by focusing on GETTING MORE of what we "think" we WANT. So HOW do we get there from here? What "needs to be done" to experience this happy, whole, complete and fulfilled quality of life? Letting go of ANY and ALL FEAR. Letting go of looking at and allowing yourself, others and/or the appearance of things "out there" to sway you and take you off your game. Letting go of the anxious and clingy expectation of WHEN and/or HOW. Letting go of the NEED to "figure things out." Those "unconscious choices" do nothing more than dim your Light and inevitably create MORE shadows and darkness in various aspects of your life. Once that choice is made, committed to and consistently followed, The Light takes care of the rest. The shadows and darkness melt away. The desires of your heart begin "showing up" in ways that MOST in "the world out there" would label as being impossible, impractical, and/or illogical. The long, hard, slow and grueling pace ceases to BE. What's REALLY REALLY cool though is that the "desires of the heart" start "showing up" in seemingly Magical and/or Miraculous ways. It's neither Magic or Miraculous. Once you choose to BE the Light, the brightest Light you CAN BE, although things DO begin falling into place and may SEEM as if something magical and miraculous is taking place, what's truly happening is that you are BEING (or at the very least BEcoming) a "conscious creator" of circumstance rather than CHOOSING, SEEING and EXPERIENCING the consistent flow of less than desirable consequences that stem from a fearful, judging, labeling, blaming, finger pointing, victim/creature of circumstance mentality which is the all too "common choice." 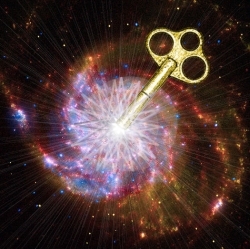 Another KEY that so many overlook...perhaps the Master Key, is DOING the same for yourself. Loving yourself, trusting yourself, accepting yourself, having empathy and compassion for yourself and "allowing" WHATEVER choices you make, HAVE made or WILL make to BE OK...unconditionally. If it "seems as if" things are less than you "truly desire", adjust, enable and allow as necessary. Although on the surface, what you begin receiving through DOING that may seem to be Magical and Miraculous, it's really only a matter of shifting from "fear based reactions" to Love focused responses...unconditionally. And THAT my friend is when you begin "consciously directing", USING, SEEING and EXPERIENCING, in a very "real world" kind of way, The Light that you are and the Real Power that's been "freely provided" to you. It's going to require "consciously exercising" yet another gift that we've ALL been freely provided. The gift of FREE WILL to "choose" as you will in a way that aligns and harmonizes with what you Love and "truly desire." rather than what you FEAR and DON'T want. The term, BE the Light may sound Greek to you; perhaps even airy fairy and foo foo. It most certainly did to me at one point. It no doubt WILL for you too unless you've chosen to break free from the predominantly held "sheeple people" mentality that most have adopted, accepted, make important life choices by and have allowed themselves to become so "seemingly limited" by. You CAN follow this "crowd" if you choose but what I can assure of is the fact that MOST don't see or experience The Light that they CAN SEE, but rather a constant barrage of shadows and darkness with an occasional little "Glimmer of Light" poking it's way through the fear, doubt, worry and confusion that the shadows and darkness ignite. The ONLY way to "illuminate" these "seemingly dark and "seemingly shadowy" times in life and move through them in the simplest, quickest and easiest way possible, is to simply BE the Light that you ARE...the BRIGHTEST Light you CAN BE and simply "allow" that to BE. Whether you've just recently begun walking the "conscious path" or you're a serious student of Life/Self Mastery, chances are good that you've heard the statement BE the Light on more than one occasion. Have you ever thought about what those words mean and/or explored at any depth, the life transforming Truth and Power behind them? If you understand that it's NOT so much about what you DO and HAVE in life that determines your success or "perceived failure", but rather what you're BEING and how you FEEL about YOURSELF and the life you're experiencing, you're there or VERY CLOSE to BEING there. You're VERY VERY close to SEEING the Light. That's also when MORE of what you truly DO desire in life starts "showing up." The "seemingly unattainable" desires of your heart cease to be desires and transmute from intangible desires to "real world" events, conditions, circumstances and things. And YES, that includes Awesome Health, Harmonious and Fulfilling Relationships AND Material Abundance too!! But MOST importantly when you choose to BE the Light that you are, the BRIGHTEST Light you CAN be, you become enabled to experience an indescribable sense of unwavering trust, peace, awe, assurance, well being and ultimately Completion. Real Joy, Real Fulfillment, a sense of Real Purpose, Real Meaning and Real Freedom becomes a way of life...unconditionally. If all tat "seems to be a bit "woo woo" or esoteric to you, let's clear the fog. Over the years I've heard the term, BE the Light, mentioned numerous times...countless times actually. Every day it seems that it's becoming more and more prevalent, primarily in New Age and Law of Attraction circles. As "true" as that is, I've noticed that, in a number of cases it's mindlessly and/or flippantly used. It's becoming quite a common term and in MANY cases often lacks depth of understanding on the part of those who do use it. It has due to the fact that; although MANY say it, little to no "tangible value" or substance describing what it truly means let alone how it applies in day to day life is provided. Combine that with the fact that few understand what The Light truly is, the power it yields, and the ALL pervasive role it plays in EVERYONE'S life (including YOURS) and in EVERY facet of life EVERY second of EVERY minute of EVERY day, it's often perceived as being nothing more than a cliche. At best, upon hearing it, most perceive the term BE the Light, to be nothing more or less than a warm and fuzzy, "feels good", esoteric statement. Because of that, it holds little to no "tangibly applicable" meaning or value for most. But it IS applicable in ALL aspects of life...in ALL of our lives and it most certainly DOES have ENORMOUS VALUE for you, me and everyone else on this planet. The fact of the matter is, when you choose to consciously, intentionally and purposefully BE the Light that you are; the brightest Light that you can be, absent all the layers of programming and indoctrination that only serve to "dim your light", you are, even though you may not realize it, making an enormous impact on the planet. It goes BEYOND that even. The term BE the Light plays an ENORMOUS role, not only in our lives as individuals, but as a collective species and on a much larger scale that actually permeates the entire cosmos. I'll explain more about WHY it does in just a bit. Because it does, I'm going to do my very best to explain how the term BE the Light can and does apply to you while at the same time clear the fog and in the process do my VERY best to bring clarity and understanding to both HOW and WHY choosing to BE the Light CAN and WILL enable and empower YOU to begin DOING things that MOST who buy into and adhere to "common knowledge" don't DO only because they don't believe they can. Put simply "applying" what follows will enable you to BE, Do and HAVE what you "truly desire" in life. I'm also going to do my best to bring the "seemingly esoteric" nature of BE the Light to the surface, take all the mystery out so it becomes obvious and drop dead simple for YOU to USE in a more conscious, intentional and purposeful kind of way. In a "real world, intangible as well as a tangibly applicable" kind of way too. Because of it's "seemingly esoteric" nature, before we begin, let's entertain the idea of using different words; a different "label" if you will other than BE the Light. We ALL have our terms and labels for describing different things. Terms and labels don't matter really. What you DO does matter. So let's look at some potential labels which ALL describe the same thing. Another way to say BE the Light in a less esoteric kind of way would be to say BE the Power. If that's still a bit "out there" for you, we could also say BE the Electricity. Regardless of which label fits best for you, each accurately conveys the very same concept and unleashes the VERY SAME Power. What's more, each does so without diminishing the meaning of it, the power behind it, the ALL pervasive nature of it, or the potential YOU hold to use it to enhance YOUR Personal Power, the quality of your life and at the very same time, enables and allows YOU to make a much needed impact in the "world out there." The fact of the matter is, we're ALL making an impact already. The impact I'm referring to will shift from the "common impact" that MOST make to a very positive, meaningful and fulfilling IMPACT that few understand they have the potential and capability to make. Consciously utilizing that potential is a choice. And You CAN. That's when the desires of the heart become fulfilled...WHATEVER they might be. Just so there's no margin for error or misunderstanding, when I say WHATEVER desires, I'm referring to WHATEVER quality of life you truly desire regardless of how Grand or bleak you might "perceive" your life to be right now. Regardless of what many believe and perceive, to BE the Light has both deep meaning and enormous VALUE in EVERY aspect of life. A kind and quality of meaning and value that most overlook and/or have little to ZERO understanding of. That includes MOST including many "spiritually minded" people too. ...Regardless of what you might think, believe or "perceive" to be TRUE. Few things are definitively true. Each of those statements are though as they apply to life. You could say they're "definitively true" because they're based on what I like to refer to as a Higher Truth. The Highest form of Truth in fact. The all pervasive, immutable, unwavering and unerring kind. The kind of truth that is eternal which creates, drives and sustains life as we know it in an "unconditional fashion." The fact of the matter is, the term BE the Light points toward and accurately describes the "seed level" that stirs and brings our inherent genius to the forefront as Lau Tzu, the founder of Taoism eluded to thousands of years ago. So how do those terms BE the Light, BE the Power and/or BE the Electricity apply to you, your life and the receiving of more of whatever it might be that you desire in life? Each of those statements, regardless of which you personally prefer to use, accurately describe the single most important foundational understanding ANYONE could have or acquire. In my opinion, it's the BEST and ONLY place to start from if you're sincere and serious about progressing down the "conscious path" in the quickest, simplest and most efficient way possible. But DOING so requires a foundational understanding of what BE the Light truly means. An "Enhanced Awareness" is required. Once that foundational understanding is acquired, it becomes much simpler, clearer and MUCH quicker to build upon this foundation, develop a "keen awareness" of how to best shine YOUR Light and begin DOING things in such a way that not only enables but EMPOWERS YOU to begin consciously, intentionally and purposefully enhancing the kind and quality of your life (and the lives of COUNTLESS others) exponentially in the simplest, quickest and easiest way that I'm aware of. The reason that's "true" is simply because it doesn't require GOING anywhere or DOING anything with the exception of going within yourself, becoming still and making a "conscious choice" to look below the surface of all the "stuff" going on in your life as well as the world "out there." That's when the "light bulbs" start coming on too!! FLOODLIGHTS would be a more accurate description actually. The better you get at that and the more you DO it, the simpler it becomes to begin not only understanding in an "intellectual kind of way how BE the Light applies to YOU as well as what you receive in life, but also SEEING in an EXPERIENTIAL kind of way that you ARE the Light. That's MUCH more than some flippantly used term in New Age or Law of Attraction circles for sure. It's been scientifically validated and the wisdom which supports and backs those discoveries is quite literally thousands of years old. Not only is the wisdom timeless, it has the potential to be life transforming RIGHT HERE, RIGHT NOW...in the Blink of an Eye in fact. All that's required of YOU to create this form of transformation physically, financially or relationally is to BE the brightest Light that you can possibly BE starting RIGHT HERE, RIGHT NOW. The fact of the matter is you don't have to DO anything with the exception of turning up the intensity of The Light that you already are. The first step in the process of BEING the brightest Light you CAN BE though is making a conscious, intentional and purposeful choice to BE the Light of Love...the brightest, most loving, heart centered and contributory Light that you CAN BE. The simplest, quickest, most effective, efficient and pleasing way to BE the Light requires nothing more or less than REMEMBERING who and what you truly are. Once achieved, it's simply a matter of realigning and harmonizing heart and mind with WHATEVER it might be that YOU Love and "truly desire" to BE, DO and HAVE in life. DOING that is not nearly as difficult or complex as MOST believe nor is the process that delivers whatever the heartfelt desire might be. You GIVE Love and you RECEIVE Love in return. You could say that Love turns up and intensifies The Light in far greater ways and to a FAR GREATER degree than most understand, are aware of and as a result, seldom see. Each of the terms BE the Light, BE the Power or BE the Electricity also accurately describe the "All Pervasive Space" where Higher Truth and Real Power resides (and comes from) in one sense. In a real world sense it's "true." Yet in another sense; in a much deeper sense, on a much larger scale, that's a misnomer. It is simply because this Light, Power and/or Electricity resides everywhere all at once making the statements "comes from" and "goes somewhere" impossible and obsolete in the "bigger scheme" of things. Although I SELDOM use the word impossible, it IS impossible for The Light to go to or come from anywhere simply because there is nowhere this Light is not. The Light, the Power and/or the Electricity (whichever label you prefer) is everywhere, ALL the time...literally. Because it is EVERYWHERE, ALL the time, there's simply nowhere for it to GO to or come from. The reason is simply because, since it's EVERYWHERE all the time there's NOWHERE for it or YOU to go. It CAN'T come from or go to ANYWHERE. You could say this Light is ALL Pervasive...it's EVERYWHERE all at once. Point being, because this Light is EVERYWHERE, ALL the time, you're already there too. So are the desires of your heart. So are the things you DON'T want. It's ALL there is actually. It's NOW HERE and it's HERE NOW. It also contains the here and now of the past as well as the future which makes the time/space continuum obsolete. Since that's "true", there's no such thing as a Lack of time, there's nothing more to DO, nowhere else to go and nothing more to search for, learn or understand in order to BE the Light of the world that you ARE, simply because you already are that. Right here, right now and every future moment of NOW, you ARE BEING the Light. We ALL are in fact. To KNOW, see and experience more of the Light that we desire to SEE in our lives, (desirable events, conditions and circumstances) it's only necessary to BE the Light that you are in a more "loving, intensified and illuminating" kind of way. If the HOW and WHY behind that statement seems somewhat or even A LOT confusing right now, no worries. Bear with me. I'll be shedding more "light" on the subject and explain in depth, WHY that's true, what that means and how YOU can begin USING the Immutable and Unwavering Truth and Power behind the statement BE the Light to create "seemingly miraculous" results in ALL aspects of your life in just a bit. Let's make this easier to grasp and digest though. For the sake of brevity and simplicity, rather than combining and using ALL those statements, BE the Light, BE the Power and BE the Electricity together, I'll be using the term BE the Light exclusively. I'll do so to ensure that the insight and direction it provides is as brief, simple, easy to understand and internalize as possible. Use whichever label suits you, feels best for you and most resonates with you so you can begin SEEING just how real and true it is so you become enabled and empowered to begin USING it IMMEDIATELY should you "choose to." Back to "BEING the Light" and the significance it holds for YOU, for those you love, for what you receive in life and on a larger scale for the world at large. And YES the potential is BIG. REALLY BIG. Infinitely so in fact. Although you MAY not fully grasp or understand the importance, the significance of and the incomprehensible Power which underlies the statement, BE the Light quite yet, it IS a potentially transformational and life changing Way of BEING that COULD and perhaps WILL; should YOU choose to "allow it to", enable you to begin, RIGHT HERE, RIGHT NOW transforming EVERY aspect of your life in ways to you didn't realize you could. Before I describe WHY and HOW that's true as well as HOW and WHY it does, I think a clarification is in order to explain why I say that BEING the Light is potentially transformational rather than saying it's going to be DEFINITELY transformational for you. The statement "potentially transformational" doesn't mean that some can and some cannot create this desired form of transformation. What it DOES mean is that we DO have a "choice" in the matter. All of us without exception. A few choices actually. The first choice is simply being willing to explore and understand how "potentially transformational" it can be to BE the Light and the second choice is simply deciding what you're willing to DO or NOT do. What are YOU willing to give to life? What quality of Light are you willing to project into the world? What we put into life we get out of life...no more no less. How does that apply to BEING the Light? Simply because the more Love (Highly Illuminated Light) you put out there, the more Highly Illuminated Light (what you LOVE) is reflected back to you. It's how things work. The Light is impartial. The Power it unleashes is also impartial. It's how YOU choose to project and use this Light and Power which determines your individual experiences in life whether they be experiences of a physical, financial, relational, mental, emotional or spiritual nature. The "potentially transformational" changes that CAN be made in EACH and EVERY aspect of life are Infinite in nature and equally available to all. Personal transformation and the vital larger scale role we play as individuals in this larger scale global transformation are only limited to and by your willingness or unwillingness to DO what MOST simply choose NOT to do. BE the Light. More than that, BE the BRIGHTEST Light that you CAN be. More specifically Master Your Ability to consistently BE the Light in a way that serves you and the greatest possible number of others and begin using YOUR power in such a way that aligns and harmonizes with what you desire to SEE and EXPERIENCE in life, which in turn enables the desired form of transformation to occur. The greatest transformation of the most desirable form stems from BEING the Light in such a way that aligns and harmonizes with "serving others", accepting others, allowing others to be who and what they choose to BE...unconditionally. In the same way, BEING the Light in a more "tangibly applicable" kind of way requires serving the world by DOING things that precipitate a shift in what you prefer NOT to SEE into what you LOVE to see, all the while "accepting" what is AS it is. Those choices and actions are what enable and allow the greatest amount of desired transformation (tangible and intangible results) to be reflected back to you. Contrary to what many self proclaimed "gurus" out there claim, growth is a process. Transformation is a process. Initially, there are steps involved to become enabled to rise above the limitations of this process where future steps become unnecessary. Many "think and believe" that DOING that is futile and hopeless simply because they don't understand the power behind and as a result never "consciously choose" to BE the Light in a way that enables and allows them to move beyond those limiting beliefs and actually DO it. It's not futile and certainly not as hopeless as many believe. Futility and hopelessness are nothing more than beliefs. They stem from a "limited form" of awareness. They are a product of mind...a very "limited and narrowly focused mind" to be more specific. A key part of the process in shifting from "perceived futility and hopelessness" to assurance, certainty and KNOWING is getting to the place where you understand a VITALLY IMPORTANT fact. It's an often overlooked FACT which is perhaps the single biggest reason why so many feel and remain "less than empowered." It's what seems to keep just as many from DOING what needs to be done to BE the Light in such a way that provides what we each desire to BE, DO, SEE and HAVE in life. What is this vitally important fact? Due to WHAT we've been taught, HOW we've been taught, what we've chosen to adopt, adhere to, believe" and as a result how we "choose" to DO things, it "seems as if" time and effort is necessary to transform our unseen desires into the tangible "stuff" that we "truly DO" desire to see in life. That CAN be "true" should we choose to buy into and adhere to this commonly held belief. Yet through "choosing" to expand our awareness beyond what MOST believe to be true; by "choosing" to expand our beliefs beyond the limitations and slow hard pace of space/time, we begin to see that there's SO MUCH more to be understood and experienced. You begin to "SEE the Light." Really SEE it. Although in the tangible world of shape and form a gestation and maturing period is "perceived" as being necessary for transforming events, conditions, circumstances from "less than desirable" into the "seemingly miraculous", at the "Light Level," neither time nor space is an obstacle. The reason it's not is simply because at this level, at the level of Light, time/space ceases to exist. "Reality is an illusion albeit a very persistent one." Guess what? Albert saw the light. He explored, experimented, discovered and scientifically validated, first and foremost that EVERYTHING is Light. (Energy) In doing so he also discovered that this ALL pervasive Light transforms and becomes what we "choose" for it to become. He "got the fact" that we could and in fact DO create the "illusion" that we call LIFE as we choose. Once this FACT is KNOWN, understood and consciously utilized, the tangible creation of desirable outcomes in EVERY aspect of life, not only CAN BE but often times are sped up exponentially without regard to space/time. When I say EVERY aspect of life I mean just that...in both tangible and intangible ways. Although most "unconscious creators" DON'T begin there in a conscious and intentional kind of way, BEING the Light that leads to desirable and "seemingly miraculous" transformation BEGINS at the intangible levels. When I refer to "intangible levels" I'm referring to the spiritual, mental, and emotional aspects of YOU. It's these attributes which we ALL possess and ARE consistently USING which ultimately determine the kind and quality of life that you'll experience in the physical, financial and relational aspects of life which determine the kind and quality of our "tangible experiences" in life. That's why it's SO vitally important to make a choice and unwavering commitment to stretch, grow, learn and understand the Higher Truth regarding, the importance of, and the unlimited power behind the statement BE the Light. It's SO MUCH more than a mindless or "seemingly esoteric" statement, I'll assure you. How is it that such a simple, succinct and "seemingly irrelevant" 3 word statement like Be the Light can transform your world in "seemingly magical and even miraculous" ways? Because of it's "seemingly esoteric nature" the statement BE the Light "seems to" have no place or hold any relevance in physical life. As widely held as this "belief" is, it has EVERYTHING to do with life and EVERYTHING in it. So how do we most effectively and efficiently utilize the statement BE the Light to experience what we desire in day to day life? The answer, although NOT widely understood, certainly underutilized and MOST DEFINITELY NOT taught in our culturally and socially established educational systems, is profoundly simple. To SEE the simplicity though, often requires coming to the place where you realize, acknowledge and choose to let go of all the "perceived complexity" that you may have learned, adopted, believe and "perceive" as being" real, right and true about life, yourself, other and the world at large. Our Beliefs Determine our Perceptions Which Determine our Choices Which Shape Our Paradigms Which Determine our "Perceived Reality"
It's our beliefs and perceptions regarding life that determine the kind and quality of choices we make which in turn unfolds into the quality of lives that we lead and experience. To experience a greater, more pleasing and more fulfilling quality of life, greater, more pleasing and more fulfilling choices must be made. Although surface level choices are consistently made, it's the under the radar choices at the spiritual, mental and emotional levels that REALLY matter. You could say it's the "subconscious" and/or "unconscious" choices that we make which CAN ignite and unleash YOUR Power OR make life "seem as if" there's little, or worse, NO POWER available to you. But there IS and it's HUGE...Infinitely SO!! It's simply a matter of BECOMING AWARE of the underlying dialogue that consistently runs through your mind on auto-pilot. It's simply a matter of making the "Paradigm Shift." Sound difficult and complex? DOING so is VERY VERY simple really. Here's how "simple it is" or at least CAN be should you let down your guard, do your VERY BEST to disarm any self limiting and self sabotaging "beliefs" that so many of us have allowed to limit our lives and open your heart so you might enable and allow yourself to FEEL, SEE, KNOW and personally EXPERIENCE just how TRUE and simple it ALL really is. As you believe, you receive." What does that have to do with BEING the Light? That's VERY simple too really. The kind and quality of the beliefs you hold determines the kind and quality of Light you project. The quality and intensity of this "Light" determines the quality and intensity of the "intangibles" (spiritual, mental and emotional) which reveal themselves as "tangible experience" and ALL the "tangible stuff" that we EXPERIENCE in life. ALL these things...ALL of these EXPERIENCES...ALL of this "tangible stuff" ALWAYS stems from and finds it's root in "The Light." And there's a VERY REAL science behind it. There is NOTHING that The Light is not. This Light IS the Power that drives and sustains life...ALL of life. The same Light is what makes life and EVERYTHING in life possible. That includes YOU. It also includes the "physical meat suit YOU" although most are unaware and as a result can't and DON'T differentiate between the two. We'll cover more about what The Light is; what it TRULY is and WHY that's definitively true in a moment. Before going there let's look at what determines the kind and quality of Light that we project as well as the tool that we ALL use to consistently project the Light that we ALL do ALL the time, although the intensities and illumination of this Light varies in degree based on OUR choices. Although it's "true" that we "receive" as we believe we will, little to no "conscious thought" is given as to WHY we believe as we believe, WHERE our beliefs stem from, let alone WHY we do receive as we believe we will. How were our beliefs formed? Where do those "beliefs" reside? What enables us to have, become aware of, recall and observe our beliefs? How do we discern if WHAT we "believe" is based on a Higher Truth or merely a perception of truth which so often keep the desires of the heart from becoming Real and Tangible? What enables and allows us to think, speak and act on the beliefs that we have acquired and DO hold? The answer to those questions is quite "simple" too. What we BELIEVE has been learned, programmed and conditioned into our minds. What we've learned, have been programmed and conditioned with comes from our parents, clergy, peers, siblings, educational systems, etc. etc etc. We believe it's "true." Here's another "truth" that most never think about or discover. MUCH if not MOST of what we've learned, been programmed with and "conditioned to BELIEVE" has been received, programmed and conditioned into those who have taught US. You could say that those who are responsible for teaching us what they have was a transfer of CONSCIOUSNESS resulting into transferred data. What could THAT possible have to do with BEING the Light? EVERYTHING begins in the mind. It ALL begins in the mind. The past, present and the future belongs to and is determined by the mind. More specifically, the kind and quality of what has unfolded, is unfolding and will unfold in YOUR life at some future point in time is determined by the quality of consciousness that we as individuals and as a human species collectively choose to accept, adopt, believe, make choices by and act upon. Those choices and actions determine the kind and quality of consciousness that we consistently process, project and utilize in tangible and measurable ways via our emotions, words and actions. But they ALL begin at the "intangible level." The spiritual and mental aspects of us. Those factors and those factors alone determine how we FEEL, what we do, how we do it, the quality and quantity of that doing and the tangible results that follow. They are ALL without exception a "product of mind." That's why it's so vitally important to consciously, intentionally and purposefully direct and USE your mind to Be the Light...the brightest, most illuminated Light that you CAN BE. There's another commonly overlooked fact regarding Light and Power that MOST are simply unaware of. Because it's YOU who choose WHAT to believe and HOW you direct the Light that determines the kind and quality of YOUR world, Nothing "out there" needs to change before we can create a world that aligns and harmonizes with what we "truly desire" to see. The fact of the matter is, once you understand, internalize and consciously apply the Power behind the statement, BE the Light, it's quite simple and easy to both SEE and KNOW that what we hope, dream, pray and so often WISH for, whether individually or collectively is already here, waiting for us to acknowledge, accept, create and EXPERIENCE it! It REALLY and TRULY doesn't matter what OTHERS believe, think, say or DO individually or collectively to create the "collective" events, conditions or circumstances that we SEE in the world "out there." What DOES matter is what YOU believe, think, say and do. So what sets the "collective" experiences that we see in the world apart from our "individual" experiences and HOW do we break free from "allowing" those "things" that we DON'T want to impact us as individuals? If you've been living on this planet for any length of time at all, you've no doubt heard the term, Be The Light. But, do you KNOW what it means? Do you KNOW what the Light is? I mean do you REALLY KNOW? Many claim to KNOW. Just as many really and truly "think they KNOW." Yet VERY few use what they "claim to and think they KNOW" in such a way that enables them to experience, in a tangibly pleasing kind of way, the incomprehensible Power that "seems to" elude MOST and at the same time transcends the rules and laws of time/space. It's due to what "seems to be" true, rational, logical, feasible and practical based on the "mindset" of most that also "seems to" suppress and even sabotage the "Individual Power" that we've ALL been freely provided to BE the Light and use our Power in ANY way we choose. Few choose in such a way and to such a degree that enables us to experience our "heartfelt desires" on an individual scale. Simply because we look at, touch, taste, smell and hear what the "collective mind" (the global population) has chosen and as a result HAVE created in tangible and measurable form. We tend to look at, judge, label and in many cases "condemn" what's unfolding all around us. We tend to ignore and go against the timeless wisdom which clearly instructs us to "judge NOT by appearances" and/or "judge NOT others" and as a result project a quality of Light that has never, can never and NEVER will enable us to BE the Light in such a way and to such a degree that enables us to SEE and EXPERIENCE our desires. In essence we "unconsciously sabotage" our desires simply because we "choose" to Be the Light on ALL levels in such a way that conflicts with projecting and transforming the Light into what we judge and label as being desirable experiences. Judgement and labeling works BOTH ways. Judging and labeling in "condemning ways" only produces MORE to condemn. Judging and labeling in accepting and "loving ways" only produces more to accept and love. The Power...The Light doesn't discern or raltionalize. It onlty takes form as YOU choose. That's WHY so many "think and believe" they have no power to change their own lives let alone ever DO anything to shift and change what's going on in the world "out there." But we DO...we ALL do. That INCLUDES YOU...regardless. The fact of the matter is, this POWER cannot BE suppressed nor sabotaged. It's EVERYWHERE, in EVERYTHING and it's ALWAYS working. With that being "true", although it may sound cold and callous initially, I'm going to share something with you that will "hopefully" enable and empower you to stretch, expand, and move beyond what you "claim to know" and/or "think you know" into the place of Ultimate KNOWING. That will in turn better enable, allow and empower you to begin "consciously directing" the Light that you constantly do project in such a way that enables you to begin attracting, creating and EXPERIENCING in tangible and measurable form, whatever the "desires of your heart" might be. If you "claim to KNOW" and REALLY and truly think you know what BE the Light means and the power behind it, yet you're not EXPERIENCING the desires of your heart in ALL aspects of YOUR life, you don't "truly KNOW" what BE the Light "REALLY means" nor do you KNOW how to consciously stir, ignite and activate this Real Power that's readily available to you in a way that consistently provides the tangible and measurable result that you DO desire. There are MANY "spiritually minded" individuals who "think they know" and adamantly defend what they "claim to know" yet who can't pay the light bill. If results aren't "tangible and measurable" they are NOT results. An intellectual understanding of The Light doesn't constitute tangible results. Granted you MAY, as so many DO, "think you KNOW" but the fact of the matter is, if you fall under the heading that MOST DO, you only "think you do." It's what so many think they know and refuse to expand upon or let go of that keeps them from ever moving into the place of Ultimate KNOWING where they REALLY and TRULY DO KNOW. Put simply, many block themselves from moving into Ultimate KNOWING simply because they refuse to let go of what they "think they know." KNOWING is a necessary and vital first step for EXPERIENCING the kind and quality of "tangible and measurable RESULTS" that so many "claim to want" yet which VERY FEW ever experience. NOT because they CAN'T. Not because ANYONE can't. But rather because they never choose to move beyond what they "think they know." But it's only because they really and truly "think" they KNOW it already. Wake up call. An intellectual understanding of The Light in and of itself does not constitute nor does it initiate the "consciously directed" transformation of Light consistently. Point being, if you're not EXPERIENCING desirable results in ALL aspects of YOUR life, you don't know as much as you "think" you do REGARDLESS of how "spiritually minded" you might "think and believe you are." There's yet another "group" who simply refuse to acknowledge, let alone explore, understand and use the power that making a conscious choice to BE the Light yields. If that applies to YOU and you're like MOST, what I share in the graphic, the headline and sub-headline above regarding BEING The Light may sound a bit woo woo, perhaps even airy fairy. If you've never taken the initiative to learn more about what Light Is; what it TRULY is and have never ventured and explored outside the widely held conventional beliefs regarding WHO and WHAT you truly are, chances are great that it sounds a little (or a LOT) CRAZY even. Perhaps even ludicrous. Believe me when I tell you...I GET that!! I GET IT only because I've been there, DONE that and most definitely bought the t-shirt. I have a WHOLE trunk full of those been there done that t-shirts in fact. The "underlying cause" for the acquisition of this "unusually large personal collection" of t-shirts was the result of BEING a "slow learner" resulting in consistently finding myself in "less than desirable" places where I had no desire to be. A series of "seemingly uncontrollable" as well as "seemingly inescapable" events, conditions and circumstances consistently unfolded in my life due to my "unwillingness" to DO something differently than I HAD been doing. What I discovered is that the single most important kind of DOING isn't a "physical activity" but rather a spiritual, mental and emotional activity. It's the kind and quality of of those activities which mirrors the quality of our physical activity (or inactivity) and the tangible and measurable results that ALWAYS follow. These "intangible activities" as well as the "tangible and measurable results" that follow take on an infinite number of forms in our lives. These results CAN BE lack and limitation, prosperity and abundance or anything in between. There was a point in time that BE the Light sounded beyond woo woo, airy fairy and crazy to me FOR SURE. That's precisely what unnecessarily delayed the materialization of my own desired outcomes. Man has that self limiting paradigm since shifted!! You could say that I've since "Seen the Light" which enabled and empowered me to make the necessary mental and emotional shifts and begin consciously directing The Light in a more pleasing and fulfilling kind of way. But before I KNEW that my Less than desired quality of life" was only a "self created paradigm" and before I "chose" to DO what was necessary to enable and allow that paradigm shift to occur; before I realized that I had the ability all along to EXPERIENCE the awe, grandeur and magnificence of life as a result of doing so, I definitely thought it was ALL those things and more. I simply didn't know what I didn't know. In fact, it's safe to say that I thought the statement BE the Light was VERY weird, WAY BEYOND woo woo, over the top airy fairy and WAY WAY beyond CRAZY even. Because of those beliefs and perceptions, I unknowingly, unconsciously and unintentionally CHOSE to remain "seemingly trapped" within this less than desirable "self created reality" for FAR LONGER than I WANTED to. Hence, WHY I acquired so many of those "been there done that t-shirts" that represented a wardrobe that was anything but fashionable, quite tattered and which I had ZERO desire to wear let alone "collect" any more of. But I've since discovered there's Real Power behind that simple, succinct yet profound statement. It's a Power that we ALL possess, are ALL an integral part of and which we can use however we choose. I've learned, after making a conscious and intentional choice to question and "unlearn" much of what I THOUGHT and BELIEVED was "true"; after venturing down and exploring MANY paths, choosing to investigate, explore and unlearn MANY self limiting and self sabotaging beliefs that I once "thought and honestly believed" were "definitively true", that we have an unlimited resource of Power available to ALL of us. That's where the importance of BEING the Light comes into play. It's important simply because everything IS Light. Here's where it "seems to get" a bit tricky though and WHY so many overlook it. It's a kind and quality of power that without exception, enables, allows and provides whatever our "heartfelt desires" might be as well as enables, allows and provides us with those things that we DON'T want. It's a Source of Light that provides us with an infinite source of Real Power where EVERYTHING comes from. HUGE Emphasis on REAL POWER, a kind and quality of which is unerring, unwavering, powerfully creative, potentially transformational and regardless of how irrational, illogical, woo woo or airy fairy YOU might "believe and perceive" it to be, VERY REAL, scientifically validated and YES, "tangibly life changing" too. We can and in fact ARE using this Real Power to become "tangibly life changing in an "awesomely pleasing" or a "seemingly horrific" kind of way. But this Real Power I'm referring to isn't limited to or by physical and finite things. Real Power transcends, yet at the same time encompasses the tangible and measurable "stuff" we see and experience in the world. The fact of the matter is, the physical and finite as well as those things that still exist only in our imagination; those "unseen and/or unrealized things" that we only conceive and imagine and/or have yet to conceive or imagine, think of, discover, explore and create are also a product of and an integral part of this Light I'm referring to. Point being, as 20th and 21st century science has discovered, everything IS Light. When you begin to SEE and understand just how REAL and TRUE that is and combine that understanding with what the mystics, sages and masters since antiquity have always claimed and taught, it becomes drop dead simple to SEE that Mind...YOUR mind is the orchestrator of this Light. Put in layman's terms you create (or if you prefer co-create) your reality as you go along. "Be transformed by the renewing our your mind." Take all "perceived" religious connotations out of that statement. Being transformed by the renewing of our minds requires nothing more and nothing less than "unlearning" what we've enabled and allowed to become programmed and conditioned into our minds. It simply means, instructs and directs us to become "aware of" and unlearn the counter productive "beliefs" we've adopted and "choose to hold." A kind and quality of learned and/or inherited beliefs that needlessly keep so many from BEING the Light and using their Power in such a way that provides what this conditioning and programming (a learned and/or inherited way of BEING) keeps us from SEEING and experiencing. There's more "timeless and transformational wisdom" to KNOW and understand that is often written off as religious nonsense yet HAS BEEN proven scientifically. If you're a spiritual seeker, you're more than likely already keenly aware that you’re more than a physical meat suit. You "get the fact", at least intellectually, that you’re an energy being gifted with a consciousness that’s infused into and intricately interconnected with your physical body, your mind and the spirit aspect of you that makes YOU (or anything else for that matter) possible at all. Chances are also great that you understand that you've been provided the gift of "free will." You get to "choose" to think and direct YOUR consciousness as you will. You could say that "consciousness" enables and allows it all to BE regardless of what IT is. To put it differently, there's NOTHING that Light is NOT. This ALL pervasive Light is infused with consciousness. Like Light, this consciousness is all pervasive. Many "spiritual seekers" understand that intellectually, yet I've found that even the most spiritually minded often lack the EXPERIENTIAL understanding that enables, empowers and allows them to consistently use this knowledge to exercise the kind and quality of Power that BEING the Light combined with consciously, intentionally and purposefully directing their consciousness provides. However we choose to direct this "consciousness" (what we decree) the Light shines upon our ways enabling and allowing the tangible creation of the "thing or things" thought of to become Real and Tangible. Point BEING, YOU are infinitely powerful. You "get to use" your "free will" to direct The Light that we are ALL an integral part of and use this Power that we ALL possess "unconditionally." You CAN "consciously direct and orchestrate The Light" in such a way that enables and allows the desires of the heart to become a very real, very enjoyable and very transformational in a life enhancing kind of way as well as "unconsciously utilize it" to create more of what you fear, doubt and consistently worry about. In either case the Power; YOUR Power can be evidenced in the kind and quality of tangible results that YOU experience in life. Here's what's ironic though...sadly ironic. Most direct this Light "unconsciously." The reason MOST do is simply because, it's a kind and quality of Power that MOST "choose" to remain "unaware of" and don't even realize they have. But we DO. We ALL do. So do YOU...regardless. Here's a VERY simple and hopefully non-esoteric, non woo woo, non airy fairy and perhaps even non-CRAZY way for describing it so you might begin SEEING that you do already possess this Power. I'm also going to provide you with access to a "specialized form of knowledge" that will provide you with the ability to learn and better understand how to begin USING this inherent power in such a way that enables you to KNOW that you do in fact HAVE IT already, that you are ALWAYS in ALL WAYS using it ALL the time and at the same time, point out HOW to USE IT consciously, intentionally and on purpose so you might begin USING and DIRECTING IT in such a way that enables, allows and empowers you to begin HAVING more of what YOU desire in Your life. All that from simply becoming aware of and understanding the timeless wisdom that clearly states Be The Light. DOING so doesn't require ANYTHING on your part. It already IS true. We ALL desire more of something in life...regardless. It's human nature. Yet most "humans" don't SEE beyond their "perceived human limitations." That leads MOST into a self limiting, or in many cases a "self sabotaging" cycle that "seems to" consistently self replicate into more of the same without apparent cause or reason in some cases. In other cases these same less than desirable cycles seem to stem from the choices and actions of others and what's taking place in the world "out there." Consistently SEEING and EXPERIENCING "more of the same" and believing that you're helpless to DO anything about it results in judging and labeling ourselves, others and the events, conditions and circumstances in our lives based on the appearance of things. And MOST do just that not realizing, let alone discovering and KNOWING who and what we "truly are" and the power we've been freely provided to BE, DO and HAVE whatsoever we choose in life...unconditionally. As it pertains to abundance, prosperity and plenty; the receiving what YOU desire, what we ALL desire is NOT limited in any way, shape or form. The ancient text....namely the Judeo Christian Bible puts it this way regarding the limits of whatever it might be that YOU desire. It clearly states Whatsoever ye desire. It doesn't take a rocket scientist, a quantum physicist or a theologian to understand that WHATSOEVER entails ANYTHING and EVERYTHING that you could possibly desire. There ARE no limits to WHAT you can BE, DO and/or HAVE in life with the exception of the limitation YOU place on the desires you hold. I certainly never understood that. It sounded nice. But due to the kind and quality of my "desires" combined with the self limiting and conflicting ways in which I was "using" my Power" combined with the appearance of tangible and measurable results that ALWAYS followed, "Yea right" always took precedence before "SEEING the Light" and making the paradigm shift I did. The fact of the matter is we CAN BE, DO and HAVE "Whatsoever we desire." It's an equally "true fact" that MOST don't realize they CAN. But there's a very "simple reason" WHY. The NOT HAVING of what we "truly desire" only becomes possible and remains a consistent reality by directing The Light in a way that conflicts with the tangible materialization of the desire. Put in another way, not having what we desire is only the result of a disharmony and/or misalignment between the desire and what we're BEING, and/or Doing. Timeless wisdom states it simply and makes it SO very clear..."You ARE the light of the world." That's more than just some Pollyanna concept. "Thou shall decree a thing and The Light will shine upon your ways." In today's verbiage YOU are thou...WE as a species are thou in fact. We "decree a thing" and The Light shines upon our ways. WE includes YOU. So now it reads YOU decree a thing and the Light shines upon YOUR ways. The kind and quality of The Light that you decree (project through your predominant thought processes) determines the kind and quality of the mental, emotional and physical "stuff" that YOU experience in life. WE means ALL of us, including YOU. I know it doesn't "seem like it" sometimes. There were MANY times in my own life where it DEFINITELY didn't "seem like" The Light was shining on my ways. In fact, during the most shadowy, dark and scary times when it "seemed as if" I was experiencing the most horrific events in my own life without a flicker of light. But as I've since discovered after walking a very diverse number of life paths, it ALWAYS holds true, ALWAYS has and ALWAYS will. The reason it ALWAYS has, ALWAYS does and ALWAYS will is simply because EVERYTHING IS Light. Although there's PLENTY of scientific data which supports just how "true" that is, I'm not going to get into all the mind boggling science or the mind bending equations that support that statement here. If you'd like to know and learn more about that, check out The Science of Success section and you'll have PLENTY of scientific data to explore, read and digest about that. Yes, science and spirituality are merging to create a single "mutual" understanding. But for the sake of time and brevity, let's stick with the timeless wisdom here. Based on those simple statements quoted above, while at the same time keeping in mind that wisdom taken from the ancient texts, here's the Reader's Digest version of HOW and WHY the statement "Be The Light" yields the kind, quality and quantity of Real Power that it does. There's nothing: NO THING that isn't comprised of Light. Take ANYTHING...and I do mean ANYTHING, place it under a powerful microscope and it becomes quite easy to SEE that EVERYTHING in it's purest and most basic form is comprised of Light. If you'd like to get REALLY REALLY in depth about HOW and WHY it does and are open to hearing my personal experiences regarding the "seemingly miraculous power" that it provides to you, me and EVERYONE else on this planet...REGARDLESS, you'll DEFINITELY want to become a part of The Enlightened Journey Global Community and prepare for the most unique, comprehensive and transformational newsletter you've EVER read OR seen...bar none. So what's necessary to Be The Light? What must YOU DO to Be The Light and unleash this Real Power in such a way that provides the physical, financial, relational, mental, emotional and spiritual desires we ALL have? The one word answer is SO very simple which is WHY most overlook the simplicity and as a result don't USE and direct the Light in a way that aligns and harmonizes with whatever it might be that they aspire to SEE in their lives. NOTHING. There's NOTHING you CAN or MUST do except to "consciously BE" what you already ARE. It's only necessary to BE the Light to fully utilize your POWER. There's absolutely nothing that YOU can do or HAVE to do to Be the Light. The reason is simply because; as modern day science has discovered and validated, like EVERYTHING else in life, you ARE the Light already. Although you can't SEE it with the limitations of the 5 physical senses, at your core, at the very essence of what makes YOU, YOU, You are Light infused with "consciousness." You truly ARE the Light of the world. This consciousness directs The Light and transmutes this same Light into the tangible and measurable "stuff" that we see and experience in our day to day lives. It's only necessary to become conscious and consistently aware of what we're "decreeing and DOING" which always determines the quality and intensity of The Light that our chosen way of BEING consistently produces, emanates and projects, which in turn determines the quality of transmutation from Light to tangible and measurable "stuff" which always in ALL WAYS determines the kind, quality and quantity of "stuff" we're seeing and experiencing. SEE? It's SOOO Simple...easy to SEE too once you become "conscious" of what and HOW you're decreeing. Here's another "fact" that so many overlook. The essence of this Light is Love. To receive WHAT you Love it's only necessary to consciously align and harmonize the Light that you are, the Light that your mind projects with the Light that enables and allows your "heartfelt desires" to transform from the Light that they are into the tangible and measurable events, conditions, circumstances, ideas, people etc. etc etc. that enable and allow you to SEE and experience the kind and quality of Light that you desire to SEE in EACH and EVERY aspect of YOUR life. You CAN should you "choose" to BE the Light, consciously and intentionally direct the Light and project Love in ALL you think, say and do. Put in layman's terms, the closer you get to Giving and Projecting Love into the world unconditionally, the more illuminated, intensified and tangibly (as well as intangibly) desirable the "Light that shines upon your ways" will become. Put into a single phrase; Choose to be BE the Light. BE the loving individual you ARE in ALL you think, say and do and you'll BE the Light in such a way that reflects and moves you ever closer toward the essence of this All Pervasive and Unconditionally Loving Light which enables you to Be, Do and Have whatsoever you "truly desire" (whatsoever you truly LOVE) in life. The Light that makes up YOUR "tangible world" is a mirrored reflection of The Light you project out into the world in "intangible" ways. There's only so much that can be conveyed in a single article. If you'd like to learn more about The Light, Love and the Laws that govern it, and you prefer a book and audio format, you might just LOVE The 7 Hidden Keys to Conscious Creation. It REALLY gets to The Heart of the Matter and illuminates the path that leads to where we ALL desire and would LOVE to be. If you're anything like the many before you who have, try it, I'm pretty certain you'll Love it and LEARN A LOT about yourself and WHY BEING the Light of Love that you already ARE enables, empowers and allows you to SEE the Light, BE the Light, project YOUR Light consciously and intentionally and once again fall in love with life and ALL the really cool things that follow. MUCH more than MOST "choose" to conceive or imagine let alone enable or allow themselves to have. I believe...in fact I KNOW that The 7 Hidden Keys to Conscious Creation can assist YOU in SEEING how and why BEING the Light in a conscious, intentional and purposeful kind of way not only CAN but WILL help you "get there" WHEREVER "there" might be or whatever it might mean for you. Whether or not you choose to learn more, now it's simply a matter of YOU choosing to BE the Light and Shine YOUR Light in a conscious, intentional and purposeful way or not. That's the one and only choice that will determine whether you'll receive (or not) the heartfelt hopes, dreams, desires and aspirations that we ALL without exception desire to SEE and experience in EVERY aspect of our lives. Now get out there and DO your very best to BE the Light that you desire to SEE and EXPERIENCE. The world certainly NEEDS more of that and it's YOU that CAN do it "if" you'll only "choose to." So, starting right here, right now and every moment that follows, simply do your very best to BE it. BE the Light. Copyright © 2013, The BE the Light article and all content on Abundance-and-Happiness.com is strictly prohibited from copy or reproduction in any form, in whole or in part, electronically or otherwise without the express written consent of the author and or Enlightened Journey Enterprises. All Rights Reserved Worldwide. Each of the resources recommended in the BE the Light article and throughout Abundance-and-Happiness.com have been personally tested and approved by the founder as a credible and effective means of accomplishing it's intended purpose. Any and all guarantees are handled through the company that provides the resource.